This book provides academic reformers with a blueprint for tackling the upheaval facing media education. It calls for a new professionalism that rejects the status quo, reflects the mission and diversity of individual programs, and demands a redefinition of both traditional media studies and the liberal arts. The book directs philosophical assaults and uses real-life examples to challenge the paralyzing effects of the "seven deadly sins" of media education. Contents: Part I:The Foundation for Reform. The New Liberal Arts. Media Education and Technology. The New Professionalism and the University: A Blueprint for Renewal. The New Professionalism and the Media Practitioners: A Blueprint for Reconstruction. Part II:Building for Reform. Frameworks for the Enriched Major. Building Toward the New Professionalism. Teachers and Students on the Front Line of Reform. Accountability and Accreditation. "Communication educators should avail themselves of the arguments presented in this book if they intend to move their curricula, their students and their academic units into the 21st century....Media educators should embrace the reforms presented here..."
"A short review cannot do justice to the fabric of reform these authors weave. Their message will tweak the consciences and stimulate the passions of readers who are part of the educational establishment....Their proposal for a New Professionalism needs to be read by anyone concerned about the product, approach, direction, or future of media education." "...a major contribution to the field for two major reasons. First, it provides informed insight within the framework of the academy as a whole. Second and most importantly, it maintains a consistent focus on students of mass communication, their learning, their potential careers, and their futures." "...the most comprehensive and best-researched history of the national movement for core curriculum to be published to date...a Croesus-like storehouse of information and citations concerning the entire spectrum of contemporary curricular research and debate." "Without a doubt, this book will be a catalyst for long overdue reform in mass communication education. The carefully reasoned approach of `The New Professionalism' places mass communication education in its appropriate context within communication study and the academy as a whole. Blanchard and Christ deliver strong messages that need to be heard by communication educators, university administrators, and especially, media practitioners." "...an important and rigorously documented case for the reform of journalism and communication education by two of the field's most passionate and caring critics. Arguing persuasively with a wide range of evidence and from their own original studies, the authors have produced a book that everyone who cares about the education of journalists and other communicators needs to digest and debate. In a field that demands dynamic change from others, the status quo has often been unshaken by the world around it. The authors, in an argument that celebrates the liberal arts and elevates professionalism in the university, have produced a vital and compelling book. It will become `required reading' in our annual Leadership Institute." "Professors Blanchard and Christ have helped open up an important debate not only about the meaning of professional media education, but also about the very concept of liberal studies in the turn-of-the-century academy. They contribute significantly to our rethinking of the necessary elements in the emerging new canon." "Journalism schools and communication departments should rethink their educational missions. And all faculty involved in that rethinking process should read this book. 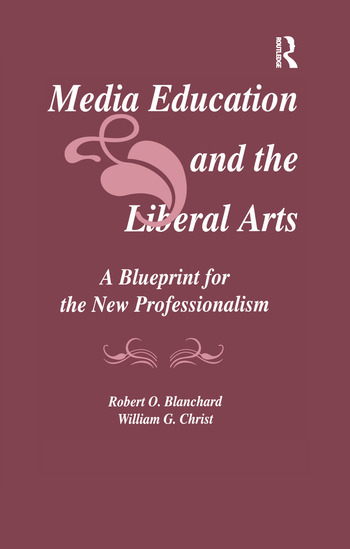 Blanchard and Christ ably describe the debates within and outside of the academy over the appropriate curricula for mass media programs and present a stimulating variety of ways of achieving a New Professionalism." "Blanchard and Christ's work confirms our curriculum reform effort to integrate the professional study areas of public relations, advertising, direct marketing and sales promotion at Northwestern's Medill School. Their writing is also a precursor to a national industry and university task force on Integrated Communications examining undergraduate professional education."